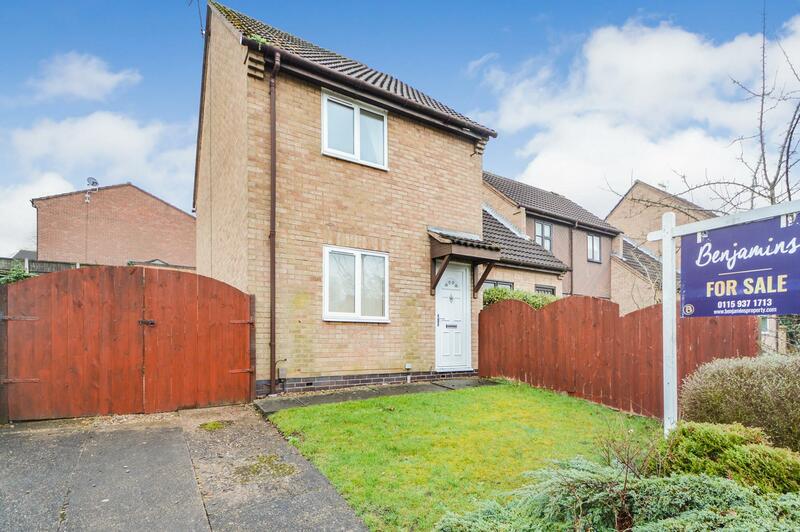 Benjamins are pleased to present to market a well presented two bedroom end terrace house on Spinney Road, Keyworth. The property briefly comprises: entrance hall, living room, breakfast kitchen, two good sized bedrooms and a newly installed bathroom. Externally, there are front and rear gardens, with off road parking. The property benefits from having no chain, UPVC double glazing, gas central heating, modern kitchen and bathroom. Keyworth is a very popular South Nottingham village served by good amenities including shops, schools, medical centre, sports facilities and public transport services. Offering easy access by car to West Bridgford, Nottingham, Leicester, the M1 and East Midlands Airport. This property would make an excellent first time buyer purchase. Call Benjamins Sales Keyworth office to make an appointment to view on 0115 9371713. With UPVC entrance door. radiator, ceiling light, carpet, stairs to first floor and door to lounge. 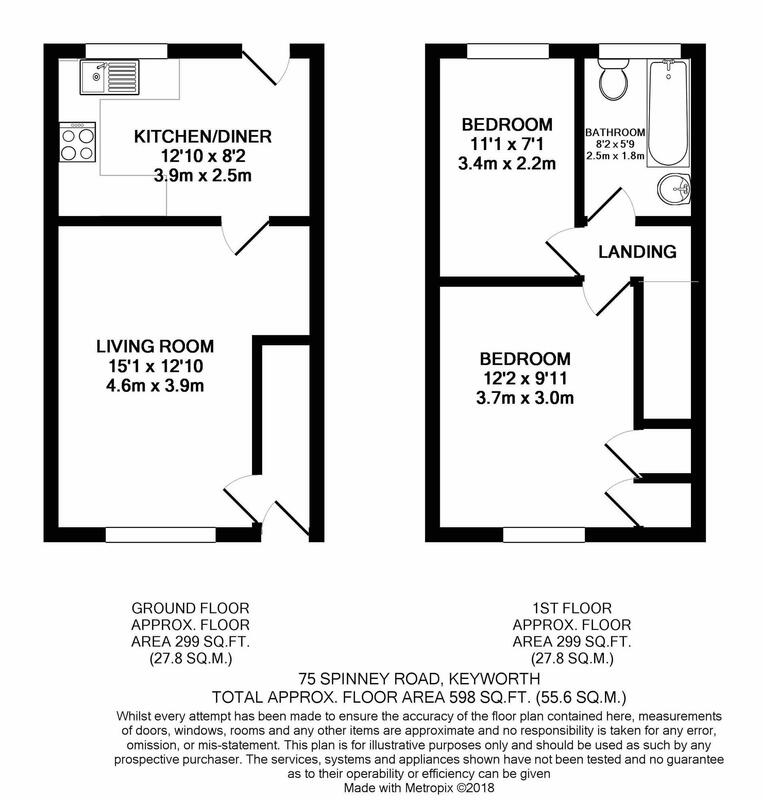 With a double glazed window to the front aspect, radiator, television point, carpet, ceiling light, electric fire with brick built surround and door to the kitchen. Fitted with a modern kitchen comprising wall, drawer and base units with rolled edge work surfaces over, inset stainless steel sink unit, electric oven and hob with extractor hood over, space for fridge/freezer, wood effect flooring, cupboard housing central heating boiler, dining area and a radiator. UPVC double glazed window to rear aspect, UPVC door to rear garden. With a UPVC double glazed window to the front aspect, radiator, built in airing cupboard housing water tank and shelving and further built in wardrobe with hanging space. carpet and ceiling light. With UPVC double glazed window to rear aspect, radiator, carpet and ceiling light. Fitted with a modern white three piece suite comprising: P-shaped bath with mixer taps and overhead electric shower and screen, low flush WC, pedestal wash hand basin with mixer taps over, radiator, wood effect flooring, obscure UPVC double glazed window to rear aspect. Council Tax Band - The local authority have advised us that the property is in council tax band B. Services - Gas, electricity, water and drainage are connected.